Game Preview: Bears at Americans, 7:05 p.m.
RADIO: WQIC-100.1 FM, Fox Sports 1460-AM, Caps Radio 24/7, Zack Fisch, the Voice of the Bears. The Hershey Bears completed their previous weekend on a high note after winning 3-1 over the Lehigh Valley Phantoms on Sunday. Mike Sgarbossa scored only 1:17 into the game, Liam O'Brien tallied the eventual game-winner in the second period, and Riley Barber scored a key insurance marker on a penalty shot in the third. Vitek Vanecek stopped 34 of 35 shots and earned second star honors. Rochester last took the ice on Saturday and rallied past the Laval Rocket, 3-2. Zach Redmond, C.J. Smith and Yannick Veilleux all scored in the third period for the Amerks. Scott Wedgewood stopped 37 of 39 shots for the win in net. The Bears successfully closed the month of October with points in five of the last six games following an 0-5-0-0 start. Since the conclusion of the Midwest road trip, Hershey has posted a respectable 4-1-0-1 record. The November schedule for the Chocolate and White features 10 games with six at Giant Center. Five games will be against the division, and in the month of November, the club will skate in only one stretch of three games in three nights. Former Bears forward Wayne Simpson was inked to a one-year AHL contract with the Rochester Americans on Aug. 16. Last season, Simpson scored 42 points (14 goals, 28 assists) in 76 games for Hershey. One of Simpson's 14 goals came in a classic at Giant Center against Rochester on Feb. 11. Simpson tied the game for the Bears at the 19:57 mark of the third period, before Joe Whitney scored the overtime winner for a dramatic 3-2 win. Simpson played under current Bears Head Coach Spencer Carberry with the South Carolina Stingrays from 2013-2015. Tonight marks the Bears lone visit to Rochester this season. 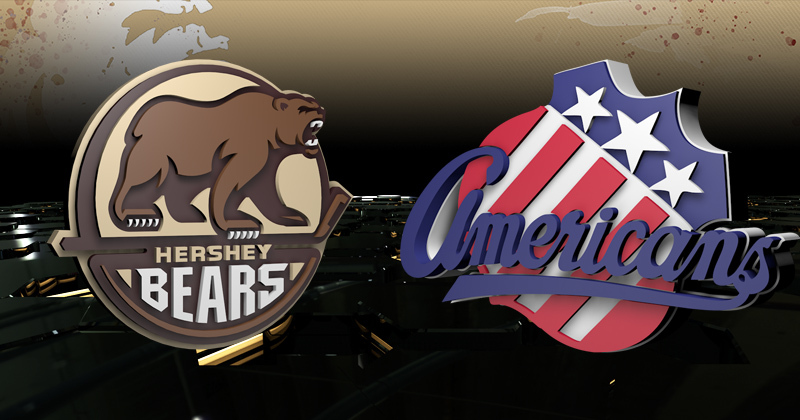 The last time Hershey played the Americans on the road was on Nov. 3, 2017. After the Bears stormed out to a 3-0 lead, the Amerks posted six goals in the second period. Lucas Johansen and Hubert Labrie erased a 6-4 deficit in the third period before the Bears ultimately fell in a shootout, 7-6. Tonight mark's the 100th career AHL game for defenseman Jonas Siegenthaler. The Zurich, Switzerland native appeared in six games with the Bears late in the 2015-16 season, and seven games the following year. Siegenthaler is now in his second professional full-season. In 99 games with the Chocolate and White, he has posted 15 points (six goals, nine assists). Travis Boyd's recent assignment to Hershey on a long-term injury conditioning assignment creates a reunion between himself and a former college teammate. Boyd was teammates with Rochester goaltender Adam Wilcox for three seasons at University of Minnesota from 2012-2015. Wilcox returns to the Rochester Americans for 2018-19 after going 12-7-2 with the Amerks last season and made his NHL debut with the Buffalo Sabres.